fell in love with the African bridegroom. Dmitri asked me to dance I left my wings on a chair. This selection comes from Karen Schubert’s chapbook I Left My Wings On A Chair, available from Kent State University Press. Purchase your copy here! 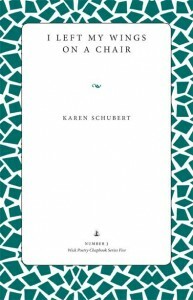 Karen Schubert’s most recent chapbooks are Black Sand Beach (Kattywompus Press, forthcoming) and I Left My Wings on a Chair (Kent State Press, 2014), selected by Kathleen Flenniken for the Wick Poetry Center prize. Her work appears or is forthcoming in PoetsArtists, The Louisville Review, American Literary Review, Best American Poetry Blog, and diode poetry journal. 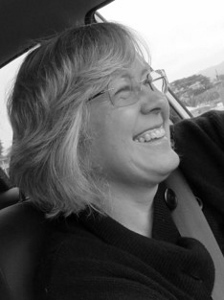 She was a 2013 writer-in-residence at Headlands Center for the Arts and her poem “Autobiography” was selected by Tony Hoagland for the first annual William Dickey Memorial Broadside Contest. She is a founding member of Lit Youngstown, a new literary arts organization in Youngstown, Ohio. not so much scooped as torn from their rough and broken cavities. other like passengers on a train, but scattered far from their mates. rhinestone barrettes, her sisters with J-names. You wanted to be her. airport in CARGO, a family comforted that He died doing what he loved. position. Let me fall face-first into a book. Say, She died on that page. roll me into the crematorium heart-stopped and sticky. edges curved in, her rippable skin warm under her heart-pocket dress. Later he will make her a mouth. that look like grey skeleton handprints. and smell like a water birth. and sound like a funeral procession? and sound like us breathing before sleep? like a rutted oyster keeping safe his pearl. like the grains of a desert mirage. or will you fill my ribcage full? 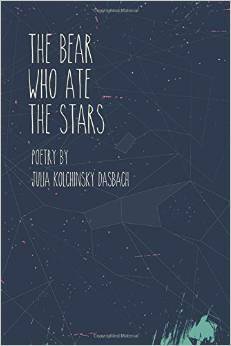 This selection comes from Julia Kolchinsky Dasbach’s chapbook The Bear Who Ate the Stars, available from Split Lip Press. Purchase your copy here! Julia Kolchinsky Dasbach emigrated as a Jewish refugee from Dnepropetrovsk, Ukraine in 1993. She holds an MFA in Poetry from the University of Oregon and is in the University of Pennsylvania’s Comparative Literature Ph.D. program. Julia’s poetry has appeared in or is forthcoming from Southern Humanities Review, Green Mountains Review, Tupelo Quarterly, Guernica, and Nashville Review, among others journals. 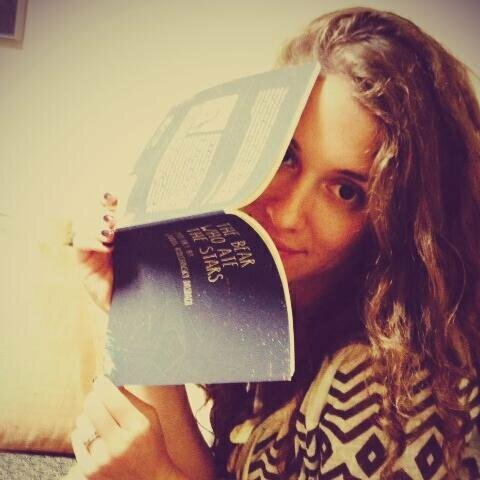 Her manuscript, The Bear Who Ate the Stars, won of Split Lip Magazine‘s Uppercut Chapbook Award, and can be purchased from Split Lip Press. Most recently, she won Burlington Book Festival Short Works Writing Contest and Spark: A Creative Anthology’s writing contest. Julia is also the Editor-in-Chief of Construction Magazine. Find out more by visiting her website. shrivel down to its silent seed. of perpetual ocean like a seashell. my voice turned to weather on your hands.